San Jose, California–based Symmetricom, Inc., has launched the SyncServer S300/S350, the latest in its line of network time servers using the latest Network Time Protocol (NTP) to synchronize time on servers, workstations, and a variety of network elements for expanding IT enterprises. The company also announced that its XLi SAASM Time and Frequency Receiver with a new Ground-Based GPS Receiver Application Module (GB-GRAM) SAASM receiver has been granted security approval by the Global Positioning Systems Wing (GPSW). 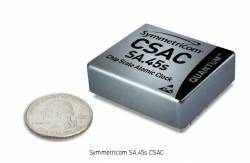 The GB-GRAM GPS Receiver is integrated into Symmetricom’s XLi SAASM (Selective Availability Anti-Spoofing Module). In addition to building on the feature set of their predecessors, the S300/S350 models add faster NTP packet processing, enhanced security and time source redundancy. According to Symmetricom, the S300/S350 models also offer NTP responsiveness with four time ports including Gigabit Ethernet for high availability, security, and throughput, supporting network clients while maintaining microsecond-caliber NTP timestamp accuracy.